India successfully tested its AAD (Advanced Area Defence) Interceptor Missile on December 28, 2017 by successfully intercepting an incoming ballistic missile. The low altitude AAD interceptor missile fired from the Abdul Kalam Island off Odisha coast zoomed in on the target, which was launched from the launching complex - III of the Integrated Test Range (ITR) also based in the island. The radar of the defence system detected the incoming missile, tracked it and provided the command to launch the interceptor missile. The mission was successful as the interceptor missile achieved a direct hit, paving the way for its deployment in the Armed Forces. Indigenously developed by DRDO, the AAD interceptor is a single stage missile powered by solid propellants. It may be recalled that on 15 March 2010, the AAD interceptor missile test was aborted, as the target missile deviated from its path and plunged into the sea. The AAD missile was to intercept the target at an altitude of 15 to 20 km over the sea. The target, a Prithvi missile, fired from a mobile launcher from the Integrated Test Range (ITR) Complex-3 at Chandipur-on-Sea, deviated from its trajectory after travelling about 11 km and fell into the sea. Later, on 26 July 2010, AAD was successfully test-fired from the ITR. 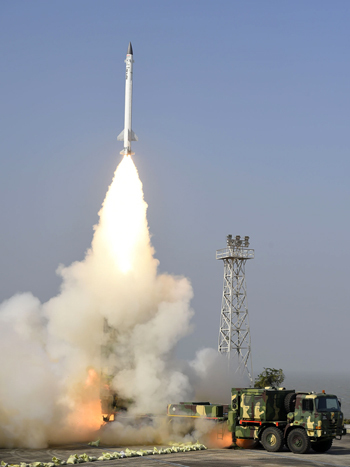 On 6 March 2011, the AAD was again successfully test-fired, the interceptor missile destroyed a 'hostile' target ballistic missile, a modified Prithvi, at an altitude of 16 km over the Bay of Bengal. On 10 February 2012 and 23 November 2012, the AAD was again successfully test-fired. Thereafter, successful test of the improved AAD was conducted on 6 April 2015, followed by and another upgraded version on 22 November 2015. On 15 May 2016, DRDO had officially reported that AAD intercepted and destroyed a Prithvi ballistic missile fired from a ship. The AAD interceptor is a 7.5m long single stage solid rocket propelled guided missile equipped with a navigation system, a hi-tech computer and an electro-mechanical activator. It has its own mobile launcher, secure data link for interception, independent tracking and homing capabilities and sophisticated radars. The DRDO has developed both high-altitude and low altitude anti-ballistic missiles. While the first phase seeks to destroy the incoming enemy missiles in the exo-atmospheric region (outside the atmosphere), the second phase envisages killing enemy missiles of more than 2,000 km range within the endo-atmospheric region. The indigenous missile shield along with the Russian S-400 air defence systems are likely to provide protection from enemy missile attacks. The Ballistic Missile Defence (BMD) shield is a two-layer missile defence system which can intercept enemy ballistic missile, both in space and in earth's atmosphere. The effort of the DRDO is eventually have a two-tiered BMD that should be able to intercept any incoming missile launched from 5,000 km away. The missiles are expected to work in tandem to ensure a hit probability of 99.8%. On 6 May 2012, DRDO had confirmed that Phase-I was complete and could be deployed to protect two cities at short notice, Phase-I being similar to the US Patriot PAC-3 system. New Delhi and Mumbai were selected for BMD deployment. After successful implementation in New Delhi and Mumbai, the system is to be extended to cover other major cities. This shield can destroy incoming ballistic missiles launched from as far as 2,500 km away. When the Phase II is completed and the Prithvi Defence Vehicle (PDV) is developed, the two anti-ballistic missiles can intercept targets from up to 5,000 km both at exo and endo-atmospheric (inside the atmosphere) regions. The successful test of the AAD interceptor on December 28, 2017 no doubt is a case for jubilation but we have years of toil ahead before effective BMD can be deployed pan-India. More significantly, we have to have a defence against advanced hypersonic missile threat, not just the conventional ballistic missile. China's Rocket Force last year has already conducted two successful tests of a new Hypersonic Glide Vehicle (HGV), called DF-17. The HGV warheads can travel at much higher speeds, lower altitudes and less-trackable trajectories. According to US intelligence, the DF-17 could be operational by around 2020. HGVs are unmanned, rocket-launched, manoeuvrable aircraft that glide and "skip" through the earth's atmosphere at incredibly fast speeds. The approach leaves defence systems less time to intercept the warhead before it drops its payload. So, compared to conventional ballistic missiles, HGVs are more complex and difficult to intercept. According to a Chinese military analyst, "The US, Japan and India should be worried about China's developments in HGV technology because it can reach targets quicker and more accurately, with military bases in Japan and even nuclear reactors in India being targeted." China is eyeing artificial intelligence for 'fire-and-forget' cruise missiles. DF-17 is one of several iterations of glider systems developed by the PLA, including the DF-ZF which has been through at least seven tests, DF-17 being weaponized version of the DF-ZF prototype. Our policy makers and the DRDO would do well to keep these developments in focus.